The Truth About Wood-boring Bees | Wood. It's Real. | Wood. It's Real. Most people are familiar with termites being a danger to the wood around their homes, but there are other critters that can be a problem too. One many people might not know about is the wood-boring bee, a.k.a. the carpenter bee. 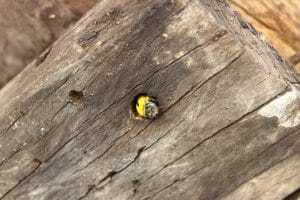 Carpenter bees often build their nests in untreated or weathered wood, given the choice. However, they can, and do, burrow into pressure treated wood. Places you might find them include old logs, eaves of houses, roof sheathing, wood decks, and even wooden patio furniture. Whether you’re building a deck out of redwood, southern pine or cedar, the best thing you can do is paint or stain the lumber. Interesting fact: while cedar repels many insects, carpenter bees are actually attracted to it. 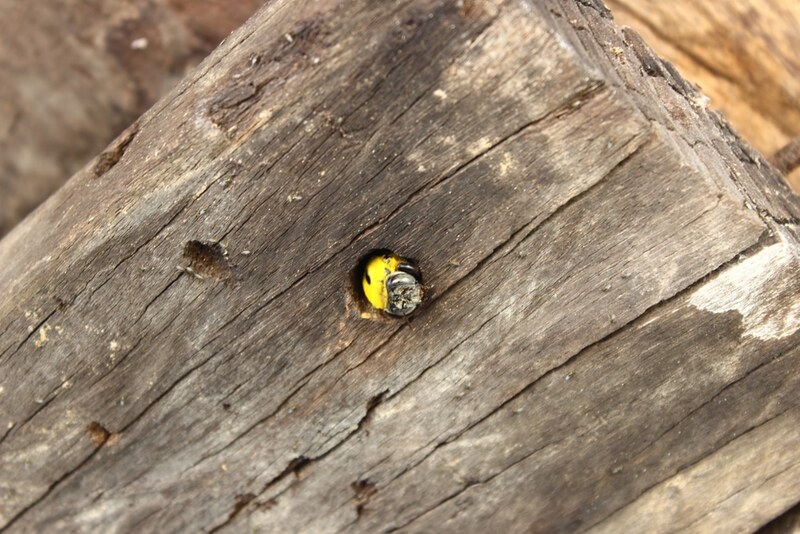 The Queen Bee chooses her nesting place but Carpenter bees do not eat through the wood. Instead, she breaks it apart with her mandibles and excavates the holes. After a small entryway is finished, the Queen will create a twisting, turning complex tunnel system inside her new home. However, except in cases of an overly large number of bees or several years of extensive tunneling, the structural integrity of the wood is not compromised. The answer is a mixed one. The females can sting you, however, they aren’t aggressive like Africanized bees. Generally speaking, if you aren’t trying to handle them or poking a finger into their territory they’ll leave you alone. The males, which are typically the ones you see hanging around, not only won’t sting you, they can’t. They don’t have any stingers. If you notice signs of carpenter bees, such as large black bees that look like the bumblebee but without the yellow stripe, perfectly round holes in the wood and piles of sawdust, you can always call a pest exterminator to come and take care of them. They can inspect the nest and develop a course of action. For those DIYers out there, you can buy insecticides and apply them yourself. You can use a liquid formula, but most experts tend to agree a dry agent is best. As the bees return to the nest they pick up the powder on their legs and track it throughout the tunnels. If you prefer to avoid chemicals there are commercially available traps you can buy online or at your local retailer. One thing to consider is the diminishing population of bees overall, which are vital to our ecosystem, so you may not want to kill them off. Instead, pre-drill some softwood boards and hang them around your property. A few hanging on a fence, for example, could be done and still be aesthetically pleasing. Think of it as building little condos for them and enticing them away from your home. Naturally, you want to protect your home, it’s going to be the biggest single expenditure of your life. If you follow some of these tips for prevention and remediation, you’ll be able to do just that.